A removable partial denture can replace one or more missing natural teeth, and is designed specifically according to the pattern of missing teeth. 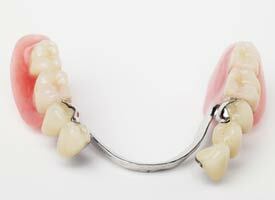 A removable partial denture may be the most practical and economical option for someone missing multiple teeth. Partial dentures are made from acrylic teeth bonded to a metal framework. They can also be made entirely from acrylic. A removable partial denture is designed according to engineering principles that help to preserve the remaining natural teeth, as well as allowing the replacement of missing teeth. Dr. Shonberg will design your partial denture so that the chewing forces are evenly distributed over the remaining teeth and soft tissues. Very minor changes to your remaining teeth may be recommended to increase the precision of the partial’s fit. A removable partial denture may be used as a “transition” from natural teeth to a more definitive, and perhaps different, type of tooth replacement. If teeth need to be removed because of advanced gum disease (periodontitis) or tooth decay (caries), the gums need to heal before a long-term tooth replacement can be made. Transitional partial dentures replace the missing teeth during this healing period. They are made from simple materials (acrylic resin), but maintain aesthetics and function, and are provided to the patient the same day the natural teeth are removed. A removable partial denture can replace multiple missing teeth economically, and does not involve re-shaping of the natural teeth next to the spaces. Partial dentures are easy to clean, but like other tooth replacement options, they require periodic professional check-ups.